When Albert Charlier died in Ottawa on June 5th, 1945, his obituary, reporting his burial in the Dayton cemetery, said only that “the deceased, of whom little is known, lived in a cottage near Dayton.” He has no tombstone in the cemetery. He never married. Nonetheless, it is possible to reconstruct the outline of his life and make his history known at last. Albert was born in Fréconrupt, La Broque, Alsace, on September 26, 1879, the son of Jean Baptiste and Marie Claire (Charlier) Charlier. The Catholic Charlier family had lived in Fréconrupt for hundreds of years. When Albert was about 15, an older friend, Josef Beller, decided to go to America. He must have written home with good news about his prospects, because at age 25 Albert also decided to emigrate. 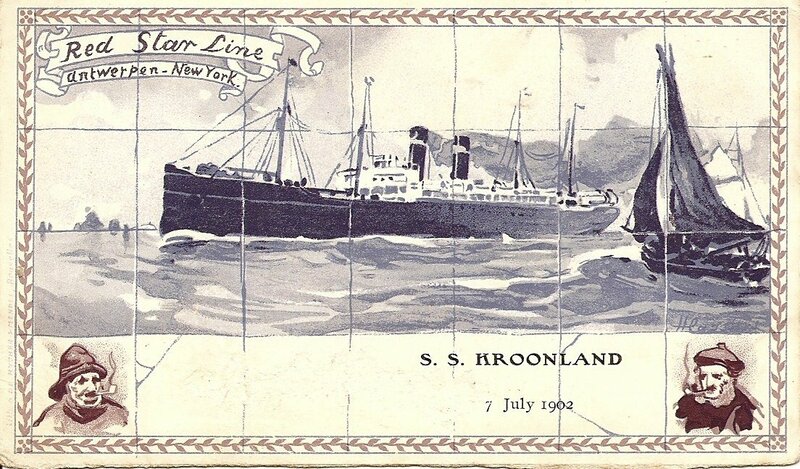 He left Antwerp on March 18, 1905, on the S S Kroonland [photo above] where he traveled in steerage. He arrived in New York City on March 28. He was 25 years, six months old, single, a laborer, and able to read and write. He paid his own passage and had $44 with him. He had been living in Rothau, in Alsace, which had recently changed from being part of France to belonging to Germany, so he was listed on the manifest as German, although actually Albert was French. He said his final destination was Dayton, Ill, where he was going to join his friend Josef Beller. Apparently he found work in Dayton, as in 1908 he was able to buy lots 6 and 7 in block 13 of the original town of Dayton from Elizabeth Benoit for $175. In 1910 he was living in Dayton working at odd jobs. He owned his house and had filed his first papers for naturalization. In 1918, when he registered for the draft, he was a mine worker for the Dayton Clay works. He was of medium height and weight, with brown hair and eyes. In 1920, he was living in his own home in Dayton and working as a railroad section laborer. He had not yet become a citizen. In 1921 he sold his house and lots in Dayton to John Garcia for $450. He went back to France, probably to see how his family had fared during the war. In 1923 he returned from Europe on the S S La Lorraine, sailing from Le Havre on April 16. His nearest relative in France was his father, Mr. Charlier in Schirmeck, Alsace. He was bound for Dayton, Illinois. He was going to join a friend, Mrs. Klari Hess Green in Dayton, Illinois. This is most likely Clara Green Hess, daughter of Jesse Green and wife of C. B. Hess. On January 14, 1938 he went to the circuit court in Ottawa and became a naturalized citizen. In April 1940 he had been out of work for 6 months . He had worked for 6 weeks in 1939 at the power plant in Dayton for a total of $100. By 1942, when he registered for the WWII draft, he was again employed at the Dayton power plant. He listed Lindo Corso of Dayton as someone who would always know his address. He died of stomach cancer June 5th, 1945, in the hospital in Ottawa, and was buried in the Dayton cemetery on June 7th. Unknown at his death, he is unknown no longer.